Saturday October, 26 was my last work day at Mark Twain Landing. Sunday was packing day. Monday was the day to hit the road again for our winter home. 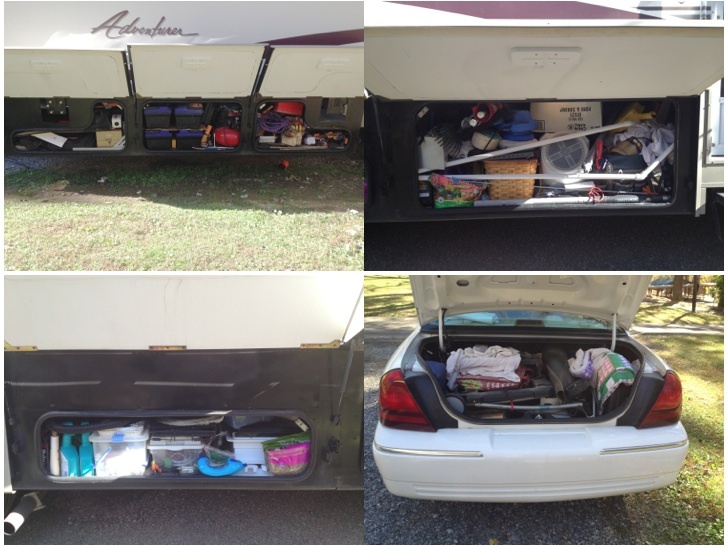 Everything fit in the under belly bins; tools were stashed in the garage and chairs folded and stored with flags and other stuff. And on the inside, things got put away. Since we have a full size queen bed, instead of a traditional RV short queen, the bed has to be lifted before the bedroom slides are closed. Patches, our Calico cat, hides behind my recliner when the bedroom slides come in. She rides there until we push the slides back out once we are at our overnight destination. Monday morning all we had left to do was to turn in my golf cart & keys, roll up the awning and fill our very empty propane tank. Carol needed to stop at Good Will and Walmart in Hannibal, MO to drop off and pick up a few last-minute items so she took off before me. I finally got on Highway J at 12:00 Noon. My first stop was Lowe’s in Hannibal to return a defective drill bit set. With that completed, I waited in Lowe’s parking lot for Carol to finished up at Walmart. We pulled out of Lowe’s parking lot at 1PM. The 100 mile trip to Hollywood Casino in St. Louis, MO on US-61/I-70 was uneventful. We originally planed to park at Ocean Queen Casino but were advised to not park anywhere near downtown St. Louis. Monday night the St. Louis Cards and St. Louis Rams were playing their games. When we were in St. Louis a week earlier, I thought about how horrible traffic would be in that area. Thanks to our friends Steve and Holly, we enjoyed a quiet evening at Hollywood Casino. Tuesday morning, a storm was approaching St. Louis from the west so we hit the road to run away. 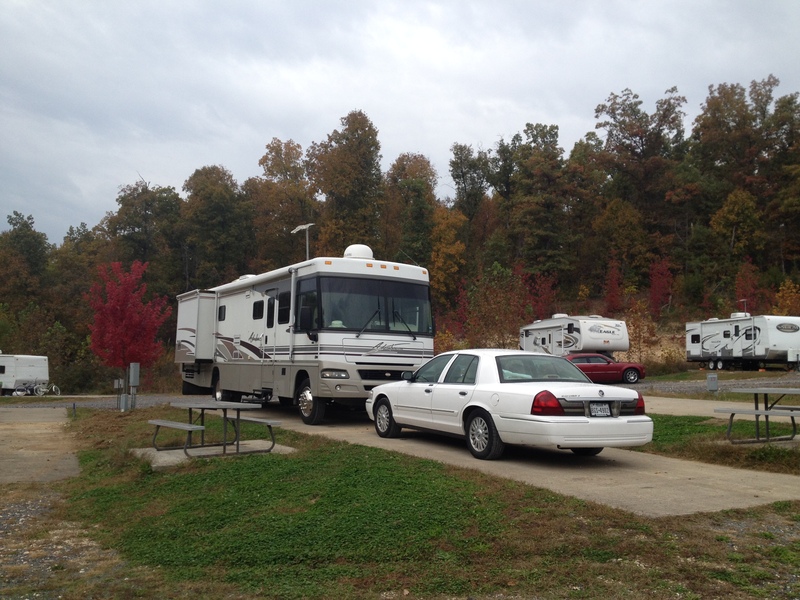 Our target was Exit31 RV Park near Grand River, KY about 215 miles away. We left St. Louis with rain starting to fall. Our route through town on I-70 took us past the Ram’s stadium. GPS led us off I-70 to the Martin Luther King Bridge which crosses the Mississippi River before reconnecting to I-70 in Illinois. Traffic was not too bad getting through the construction when we got off I-70. On the Illinois side, we merged back on to I-70/I-64/I-55 then off on I-64. We merged onto I-57 in Mt. Vernon, IL, where we encountered construction. Traffic was not bad and moved through that area smoothly. Made a fuel stop in Mt Vernon. Just past Marion, IL we turned off on I-24. Encountered more construction on the bridge crossing the Ohio river going into Kentucky. On the approach to the bridge, we saw a sign that said “No Vehicles Wider Than 11 Feet”. 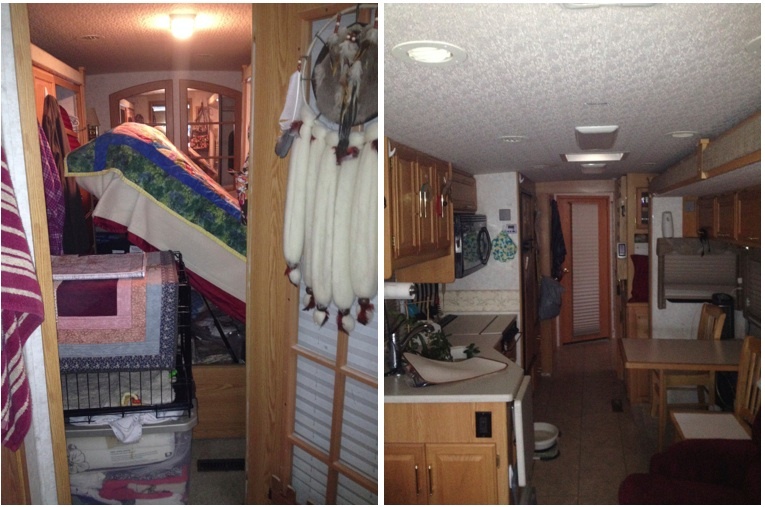 Most RVers know how tall their RVs are. Do we know how wide our RVs are? We got through so I know our RV is less than 11 feet wide. Continued our drive past Paducah, where we stayed as we headed to Mo in the Spring, and arrived at Exit 31 RV park about 3PM. 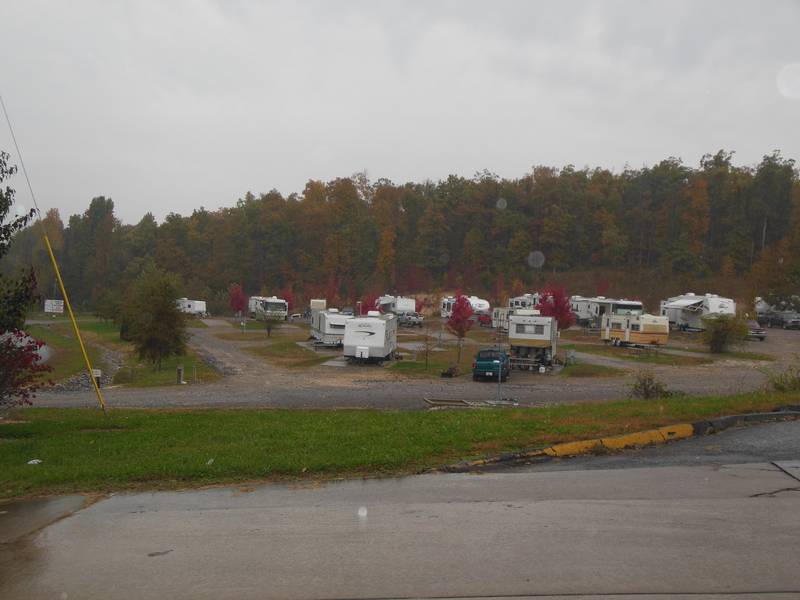 I had read on RV Park Reviews that Exit31 RV park was nothing to write home about. You be the judge. Here is a better view of our site. We had a nice flat and level concrete pad with electricity, water, sewer, cable and WiFi. As an added amenity, we had a tree – all for $18.50. Good thing we did not need to use the picnic table. This worked as an overnight stop. There are a couple of state parks near by but they were closed for the season. Too bad. One of the reasons we stopped here was because our friends in MO, (John/Elaine and Steve/Holly) recommend visiting Patti’s Settlement in Grand River, KY. WOW they were dead on with that recommendation. Other than Patti’s Settlement was getting read for Christmas and the rain lingered into the afternoon, I am glad we made this stop. If you are in western Kentucky near Paducah, you must make a stop at Patti’s Settlement. We shared their infamous 2″ Pork Chop dinner and enjoyed a leisurely stroll through the shops that were open. Wednesday morning Mr. Sunshine decided to pay us a visit. After refueling , we had a beautiful drive on I-24 from Grand Rivers, KY to Murfreesboro, TN. Of course, there was more highway construction on I-24 just as we entered Nashville. Traffic slowed a bit but moved steadily. We drove past LP Field, home field of the Tennessee Titans. I thought briefly of the history of that team. Bud Adams, owner and Bum Phillips, former head coach (1975-1980) died recently. Bum Phillips died October 18, 2013 and Budd Adams died 3 days later on October 21, 2013. Then I thought about Jeff Fisher, former head coach (1994-2010) who moved with the team from Houston to Nashville in 1997. His 16 year tenure with the Houston Oilers / Tennessee Titans earned him the honor of longest tenure among active coaches with the same team. And now he coaches the St. Louis Rams. Back on our travel, drivers in Nashville appear to be pretty aggressive on the highway. We made our way to Camp Walmart in Murfreesboro. After we get parked and had a short rest, we met up with Elaine and Pete our friends we worked with at Mark Twain Landing. 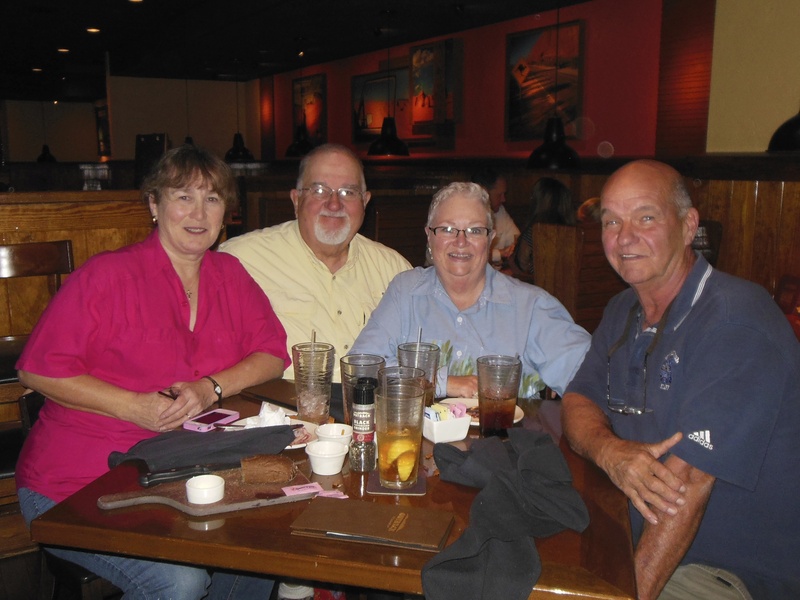 After a visit to their home in Murfreesboro, we enjoyed dinner at Outback. Sometimes we just have to break our rule of not eating at national chains. After a too short visit, we shared hugs and said see ya later. By the time we got back to Camp Walmart, we found we were not the lone campers. We had an 18-wheeler parked right next to us. I did not get a picture of is trailer, but it was about 4 feet way from our door. We were planning on meeting with my nephew and his girlfriend on Thursday AM for breakfast. However, I had received a weather alert that said strong winds 35-45 mph with gusts up to 55 mph would hit central Tennessee before noon. We decided it would be best to cancel our breakfast and get on the road. By the time we pulled onto the highway, the raindrops began to fall. 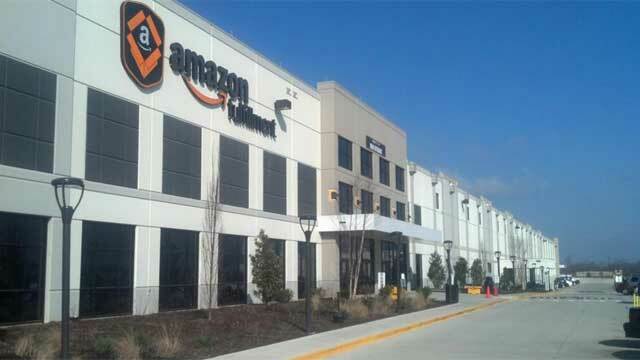 We drove past the newest of the Amazon Fulfillment Centers in I-840 just north of Murfreesboro. One of these winters, I am going to become a workamper at Amazon. It was a good thing we left when we did. Rain followed us all the way to Knoxville. The trip on I-40 was good, traffic was not bad and drivers were courteous. We made a fuel stop in Crossville, TN about half way to our final distination. The closer we got to Knoxsville, the more the scenery look like this. I only wish we had sun shine to view the colors. I can say the colors made the drive more enjoyable. I wanted to stop every five minutes to take in the beauty. While we may be on the trailing age of fall foliage for 2013, there are plenty of colorful areas to explore in the coming weeks. A few miles from Knoxville, we turned of I-40 onto I-140 then TN-33 towards Maryville. On the east side of Maryville, we turned east on TN-73 and headed for Townsend and Tremont Outdoor Resort. The final approach to Tremont reminded me of our trip to Blue Ridge, GA in 2012. Only this time the trees where displaying their fall beauty. We pulled into the campground around 3PM. After meeting Judi and Jess, our managers, Jess escorted us to our temporary site. As we were settling for the evening, we were advised to take precautions because the heavy winds that hit Nashville mid-day on Thursday were expected to hit our area in eastern TN around midnight. Friday morning we woke up and found there were no downed trees in the park. Apparently the winds were broken up or at least diminished when they encountered the edge of the mountains to our east. We were thankful that once again God protected us. After a leisurely morning, we headed into Townsend for breakfast. The Firefly Cafe is a place we will visit again. Next stop was a sort trip to Marysville so I can have my hearing aid tubes replaced. That is something I need to do about every 60 days. We found Blount Hearing & Speech Services. They took care of my hearing aids and gave us names of physicians in Maryville we will be meeting so we will have a local PCP to take care of us while we are here. How cool is that. When we got back to Tremont our site was ready. Jess escorted us up the hill, around the back of the store, and into our site. We spent the rest of the afternoon nesting. Tomorrow, I get to wash the road grim off our home, build a frame for our yard sign and take more photos. 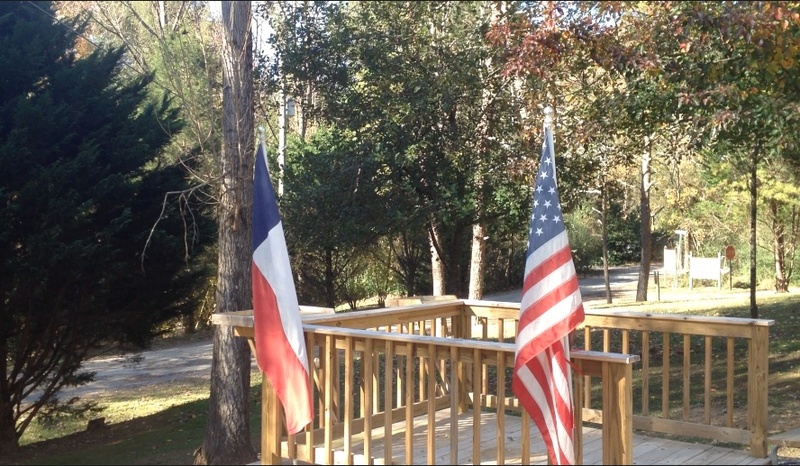 Enjoy this view of our deck. Thanks for stopping by. Y’all come back now.